2011 made sartorial history in more ways than one, so it's probably no coincidence that the hottest stories of the year were also some of the most groundbreaking. From the Duchess of Cambridge's hand-embroidered Alexander McQueen wedding gown to lab-grown skins that could replace animals in cosmetics testing, here are seven revolutionary stories that are changing the face of fashion, science, and design. Feeling nostalgic? 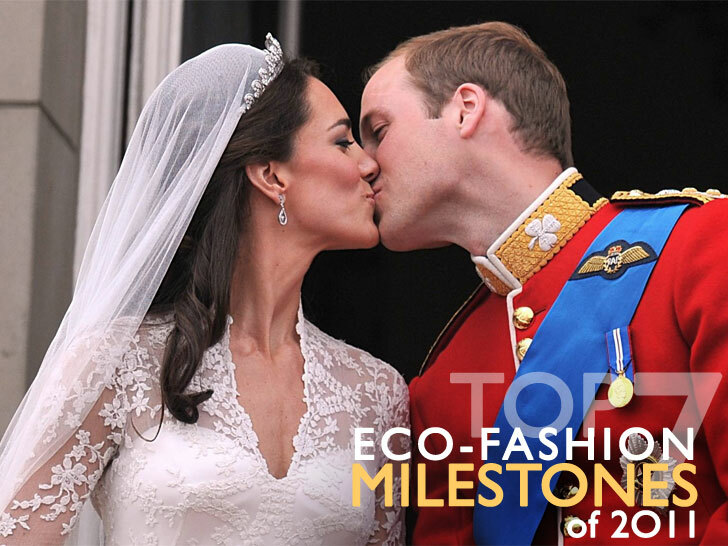 Skip back a year for the seven most popular eco-fashion stories of 2010. Triumph International in Japan is accepting used bras in select stores for recycling into boiler and power-generating fuel. The initiative could relieve Japanese women of a constant source of embarrassment. A survey by Wacoal found that 61 percent of respondents hesitate to dispose of their old bras because the clear plastic bags many municipalities require attract perverts. In March, a consortium of manufacturing and retail giants, non-governmental organizations, academic experts, and the U.S. Environmental Protection Agency announced they were banding together to reduce the social and environmental impacts of apparel and footwear products sold worldwide. The Sustainable Apparel Coalition, which comprises bold-face names such as Adidas, Gap, H&M, Nike, Levi's, Timberland, Target, and Walmart, seeks to address the industry’s sustainability challenges as both a “business imperative and an opportunity,” according to a press release. Good news for lab rats! Synthetic skins are now good enough to mimic animal skins in tests, according to research that appeared in the June 5 issue of the Journal of Applied Polymer Science Bharat Bhushan, a professor at Ohio State University and Wei Tang, an engineer at China University of Mining and Technology used atomic force microscopes to observe the responses of pseudo and rat skins to a generic skin cream. The result? Even at a scale of 100 nanometers—or one-thousandth the width of a human hair—all the samples reacted in a similar fashion. Patagonia always had a reputation for making durable, low-impact outdoor apparel, but the California label is taking its sustainable ethos one step further with the launch of Common Threads, an initiative that seeks to help consumers, well, consume less. Together with eBay, Patagonia has created a virtual swap meet for buying and selling used Patagonia gear—an unexpected retail model that’s a first for a major brand. The underlying message, one that underscores one of eBay’s core commandments, is clear: The greenest product is the one that already exists. Scientists at Toray Industries in Japan have created samples of what they claim is the world’s first fully renewable, bio-based polyethylene terephthalate (PET) fiber—the stuff that polyester’s made of. Toray succeeded where no one else did by using bio-based paraxylene, which a company called Gevo derives from refining biofuel rather than crude oil. One of the least-glamorous aspects of the garment industry are the toxic chemicals used to dye textiles. Although support abounds for less-harmful dyes, along with stronger regulations to process the tainted effluent before it’s discharged, hormone-disrupting substances and their ilk continue to find their way into waterways and drinking supplies in countries such as China, India, and Bangladesh. Maria Jonstrup, a research student at Lund University in Sweden, however, has arrived at an environmentally friendly purification process that leaves only clean water behind.